On 9 Jan. 2019, the Central Bureau for Astronomical Telegrams issued an electronic telegram reporting that the inner main belt asteroid (6478) Gault had a tail. This made the object a very important target to monitor and we managed to get a few images on two nights. On 8 Jan. 2019, the CBET 4594 (subcription required) issued by the Central Bureau for Astronomical Telegrams reported that asteroid (6478) Gault was spotted to show an evident, narrow tail by the Asteroid Terrestrial-Impact Last Alert System” (ATLAS) team. This was a very interesting announcement, as it is rare to see an object living in the inner asteroid belt, as Gault, to show such a cometary, peculiar feature. (6478) Gault has a typical asteroid orbit, so from this point of view we did not expect to see it wearing a tail. This behavior, among objects moving in the asteroid belt, is quite rare: those few objects living there and showing from time to time hints of cometary nature are called main-belt comets. One of them is asteroid 7968 Elst–Pizarro, perhaps the best known example of this asteroid/comet “dualism”. As soon as we learned about this exceptional activity, we planned some follow-up via the Virtual Telescope’s robotic facility. Weather did not cooperate and we had to wait for a couple of days before the sky was clear. 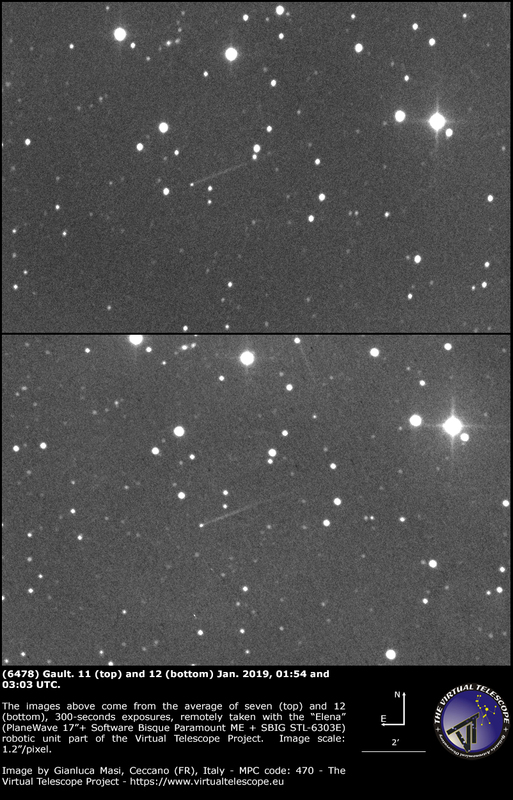 The images above come from the average of seven (top) and twelve (bottom) 300-seconds exposures, unfiltered, remotely collected with the (PlaneWave 17″+Paramount ME+SBIG STL-6303E) robotic unit available at the Virtual Telescope Project. The image scale is 1.2″/pixel. Observations were not easy, but we managed to capture the tail pretty well. Measuring the tail, we have found that on 11 Jan. it had a length of 2.9 arc-minutes, while on 12 Jan. (under better sky conditions) we measured 3.4 arc-minutes.In both cases, the tail was pointing to position angle PA = 292 deg. As far as we could see, the object’s head was stellar in its appearance. On 12 Jan. the tail does NOT look rectilinear. What happened there? A possible scenario is that there was a collision between Gault and another object, releasing material into space, that we see like a tail/trail. Further studies will likely help understanding this truly fascinating event. Of course, we plan to closely monitor (6478) Gault in the next months. Next story 21 Jan. 2019 SuperMoon Total Eclipse – live event, online!